The Ultra Tonic Pickup for steel string guitars from James May Engineering is a passive, brideplate-mounted, 5-transducer pickup with on-board feedback suppression. James is also a partner in Audio Sprockets, creators of the ToneDexter (see my article on Pickups and Preamps). A variation of the pickup is available for nylon string guitars. Soundboard Transducers (SBT’s), piezo-electric crystals often embedded in rectangular, triangular, or disc-shaped modules, are offered in several flavors (K&K Pure Mini, JJB Soundboard Transducer, Trance Audio Amulet Acoustic Lens, Dazzo, etc) and are highly regarded for their ability to represent the sound of an acoustic guitar in an amplified setting, often with much less piezo “quack” than Under Saddle Transducers (UST’s). A UST pickup is comprised of piezo crystals housed in a thin ribbon. It is laid in the saddle slot of the bridge, the saddle rests atop the UST and the strings press the saddle tightly against the pickup. The saddle is the only material separating the pickup from direct contact with the strings. An SBT pickup is comprised of piezo crystals housed in a medium or container. That container is typically attached to the bridgeplate inside the guitar. In addition to the material of the saddle, the remaining material of the bridge beneath the saddle, the material of the soundboard, and the very bridgeplate itself sit between the strings and the pickup. In my experience, SBT’s tend to be more prone to feedback than their under saddle siblings, especially at higher volumes Apparently, this is due to their tendency to co-mingle lower frequencies. This is commonly experienced as an overall boomy or muddy sound. 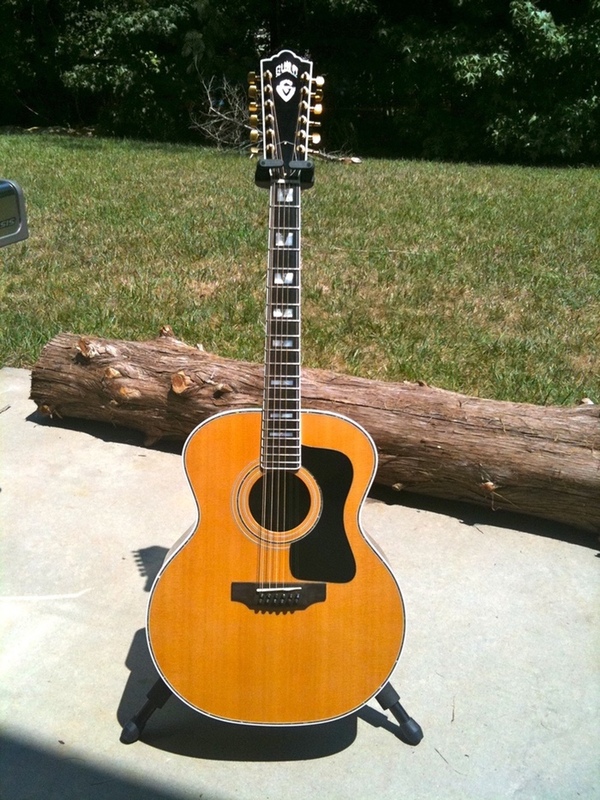 Here are three back-to-back recordings of my 1976 Guild F-512. The first clip is recorded through a Shure KSM141 microphone alone, as a reference. The second clip is recorded (directly) through an LR Baggs Anthem pickup. The third clip is recorded using a (newly installed) Ultra Tonic pickup from James May Engineering, the signal ran through an Audio Sprockets ToneDexter trained with that same Shure KSM141 microphone. Here I'm playing my instrumental "Run, Don't Walk" on one of my own builds, a curly Sinker Redqood and Claro Walnut jumbo, recorded direct using only the UltraTonic pickup attached to the bridgeplate. For the recording, I have added a little reverb, but no EQ. I selected a 12 string as my test guitar for my first installation, thinking that if the new pickup could address the cacophony occurring within the soundbox (aka "lush overtones") that tend to overwhelm most pickups, it could handle anything. 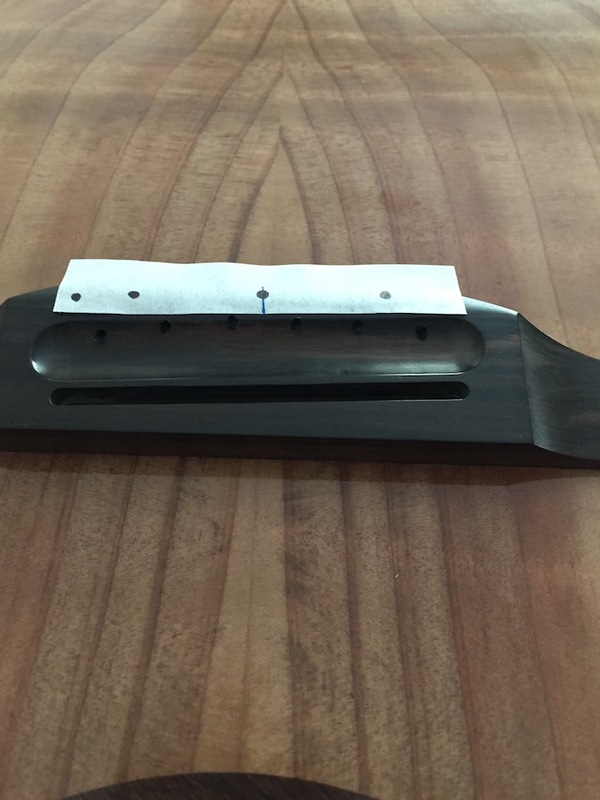 Installation is similar to installing K&K Pure pickups, where the disc-shaped transducers are affixed to the bridgeplate beneath the saddle position using gel cyanoacrylate glue. Proper placement of an SBT is much more critical than installing a UST. Think location, location, location. Some installers have chosen to test fit an SBT using a double-sided tape as, once it is secured with glue, it is pretty much there to stay. It had better be in an acceptable, if not optimal, location. Where the K&K Pure Mini comes with three (3) discs, the Ultra Tonic supplies two (2) additional discs for a total of five (5), with one disc being intended to bolster the (typically under-represented) 1st string and the other, a much larger disc, used to assist with feedback suppression. Three (3) of the four (4) smaller discs are attached in a similar way as you would attach a K&K Pure Mini, spaced appropriately below the saddle position. The fourth disc is attached as close to the 1st string as is practical, in line with the other three (3) discs, if possible. I studied the instructions supplied with the Ultra Tonic and, for my initial install, opted to fashion a jig to assist me with placement of the discs. Three discs would be located between the pin holes, just as they would with a K&K install. Due to the proximity of the X-brace on this 12 string, I had to locate the fourth disc behind the saddle, behind the string hole. The large suppression disc is intended to be attached toward the back of the bridgeplate on the bass strings side, well away from the saddle or strings. Inadvertently, I allowed the disc to drift a bit too far back and the glue "seized" in a position where the disc was overhanging the bridgeplate. I obtained an additional disc from James and replaced my mistake, attaching the new disc in the correct position. Here is a photo of an install inside one of my builds which has a pinless bridge and a carbon fiber bridgeplate. 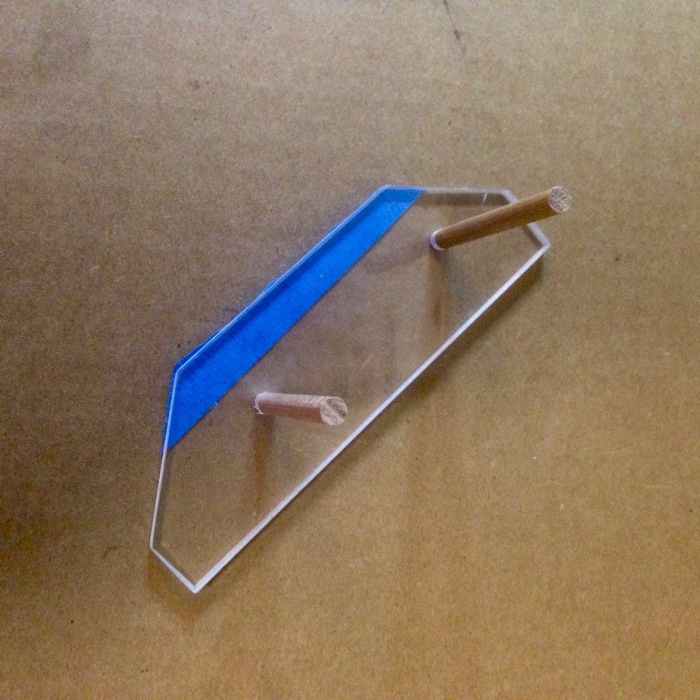 It is not possible to make use of a custom installation jig (such as the one I used on the 12 string), as there are no holes through the soundboard. 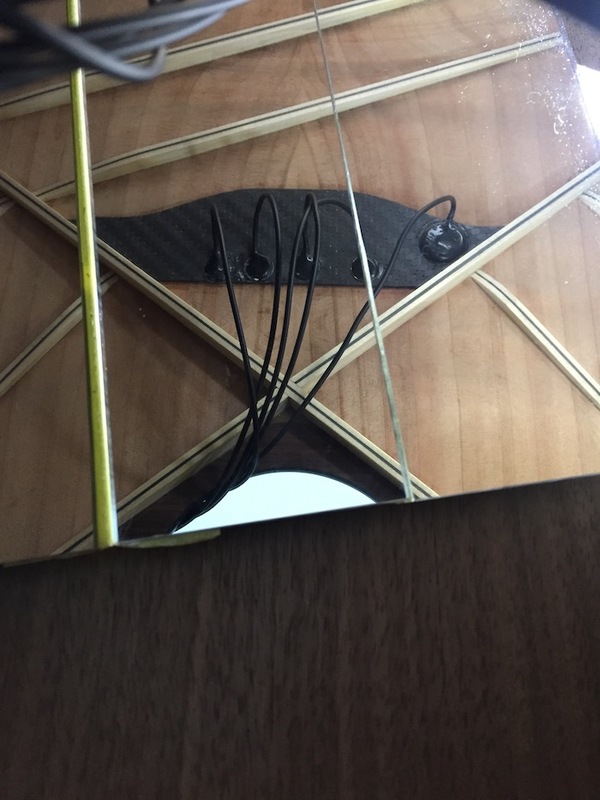 A piece of tape identifies the string and pickup positions. I am using an extremely low tack tape (I need to be able to easily remove it, later). I have fashioned a high-tech pickup placement jig using bendable wire and double-stick (carpet) tape. If you have never attempted this before, I would suggest doing a few dry trial runs (no glue), as working in a mirror can produce unexpected results! A Word of Caution: CYA glue can permanently bond skin to a variety of materials, including SBT's and bridgeplates. If you are locating and securing these discs manually, you may want to wear a glove. 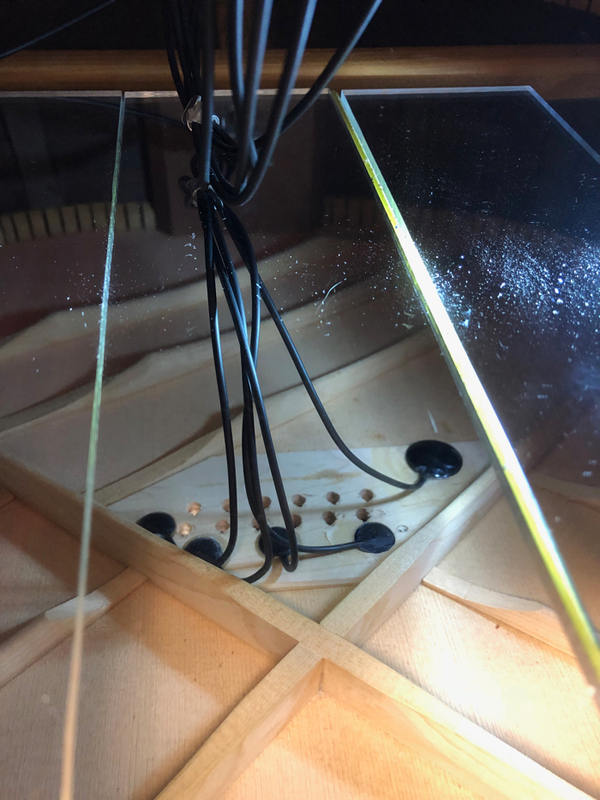 At this point the pickups are installed and I could simply secure the endpin jack, plug the guitar in to your favorite amp and play on, though I would not benefit from the onboard feedback suppression. The pickups sound very good, very “K&K”, with the notable benefit of improved volume on the 1st and 2nd strings. At this point the pickups are installed and I could simply secure the endpin jack, plug the guitar in to my favorite amp and play on, though I would not benefit from the onboard feedback suppression. This is the ideal time to test the efficacy of the 4th disc placement, to determine if the additional boost in volume of the 1st string is sufficient. With the shorting jumper removed, I slowly strum across the strings, listening to the overall volume level, particularly the volume of the 1st string. In the unlikely event it is too loud, the 4th disc can be either relocated, simply disconnected, or removed entirely. The pickups sound very good, very “K&K”, with the notable benefit of improved volume on the 1st and 2nd strings (this is a 12 string). In order to reap the rewards of the added circuitry accompanying the Ultra Tonic Pickup, it is necessary to take the pickup through the audio setup stage. This involves making adjustments to DIP switches found on the circuit board attached to the endpin jack. 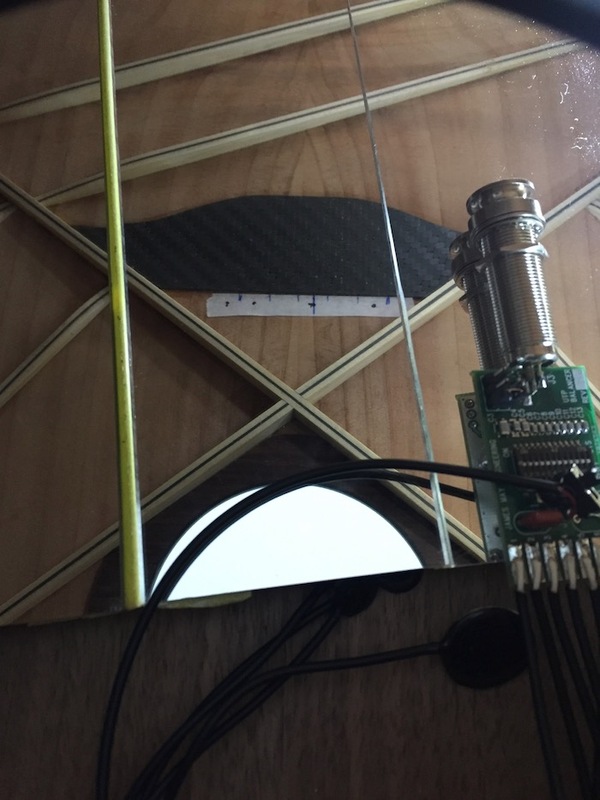 The endpin jack and circuit board are left outside of the soundhole until audio setup is complete. I rested the jack on a folded paper towel, and taped it securely to the top. The goal of the DIP switch selection process is to identify the best ratio or proportion for mixing in the larger, deliberately out-of-phase, suppression disc (the disc mounted farthest away from the strings) with the smaller, main discs (mounted beneath the string/saddle point of contact) so as to minimize the many potential resonances of the top plate (soundboard). This will result in a single DIP switch being set to the ON position, with all others switch OFF. The resonant frequency of the soundboard is hunted down with the aid of a tone generator (capable of producing a sine wave between 80 and 250Hz), an exciter, and a voltage meter (capable of reading single digit millivolts). Tone generators can be sophisticated standalone boxes or software applications run from your computer (I use the latter, and happen to like the free, aptly-named AudioTest by Katsura Shareware). An exciter is a speaker that is both capable of reproducing the needed tone (audio frequency) and is able to be put in contact with the soundboard of the guitar without doing damage. James May Engineering offers a simple exciter that works just fine. The tone is generated. The exciter vibrates the guitar (audibly). 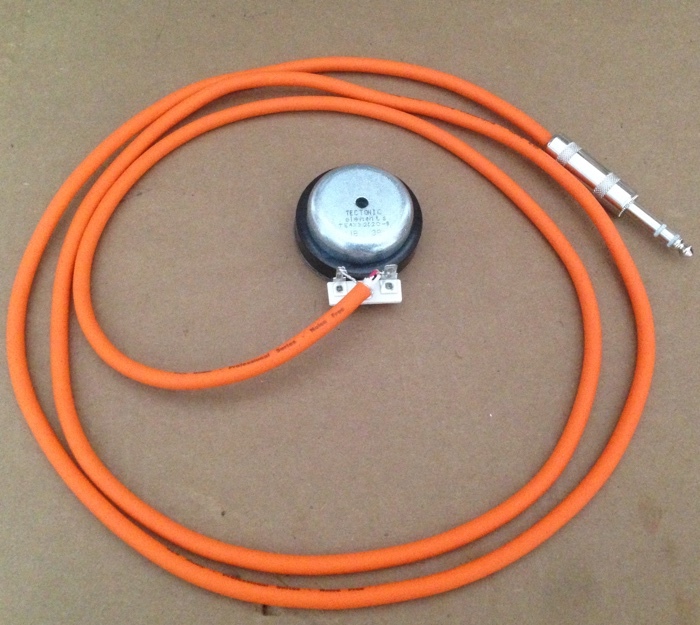 A (milli) voltage meter, connected to the endpin jack, reads the output voltage of the pickup (created by the kinetic energy of the vibrating top). Locating the resonant frequency is a matter of altering the frequency of the sine wave (using the tone generator) and watching for the highest voltage reading on the meter. My 12 string happened to really move at 100Hz. Both 99 and 101Hz saw significantly lower output. 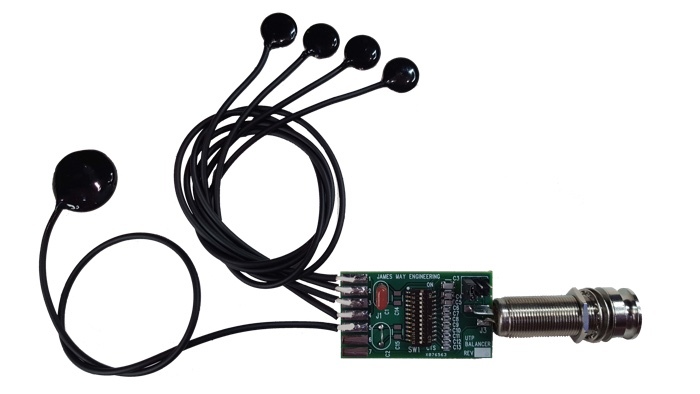 With a shorting jumper (supplied with the pickup) installed in the middle position (position 2), a series of 12 DIP switches attached to the endpin jack are then switched ON and OFF, one at a time, watching the meter for the lowest output. These DIP switches are associated with that fifth (larger) disc, the one that was installed away from the saddle location. The DIP switch that produces the lowest output on meter wins, and gets set to ON for the rest of it’s life. As with most tests, altering the parameters will affect the outcome. Changing the location of the pickups would necessitate a new test. 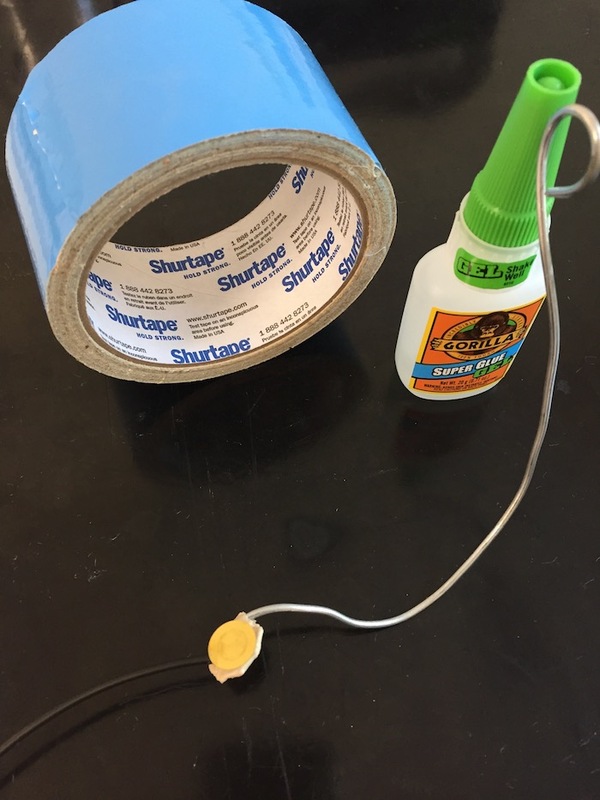 While I have not done it (yet), I think it would be advisable to retest a double-stick tape installation after gluing the transducers in place, as things could change. Once you are happy with the results, the endpin jack can be installed and the wires secured using any number of methods. After completing my testing and setting the appropriate switch, re-testing the audio output of the pickup in this new condition was eye opening. The predominant 11th string volume was quieter. The boominess was gone! The highs were clean and the mids no longer sounded like a piezo-electric pickup. Pretty impressive! 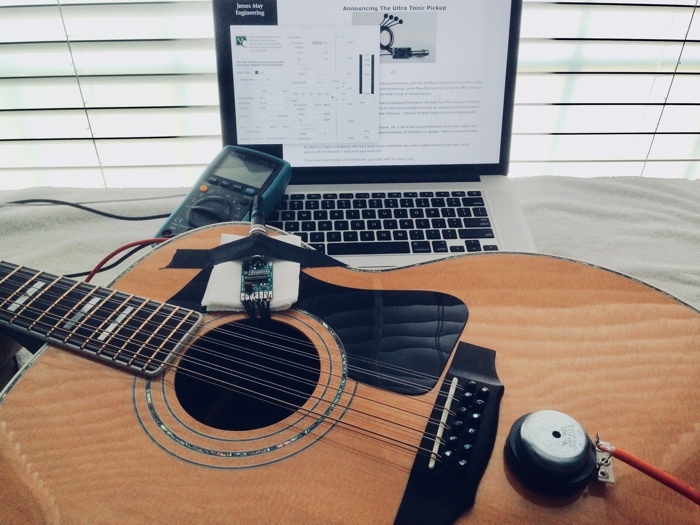 I now have an acoustic guitar with a battery-free pickup system that can readily be plugged into most any sound reinforcement scenario and provide me with an amplified representation of my acoustic sound. In my quest for "my guitar, only louder", I knew I could do even better by processing the signal through the ToneDexter. That signal is what you are hearing in the supplied recording. 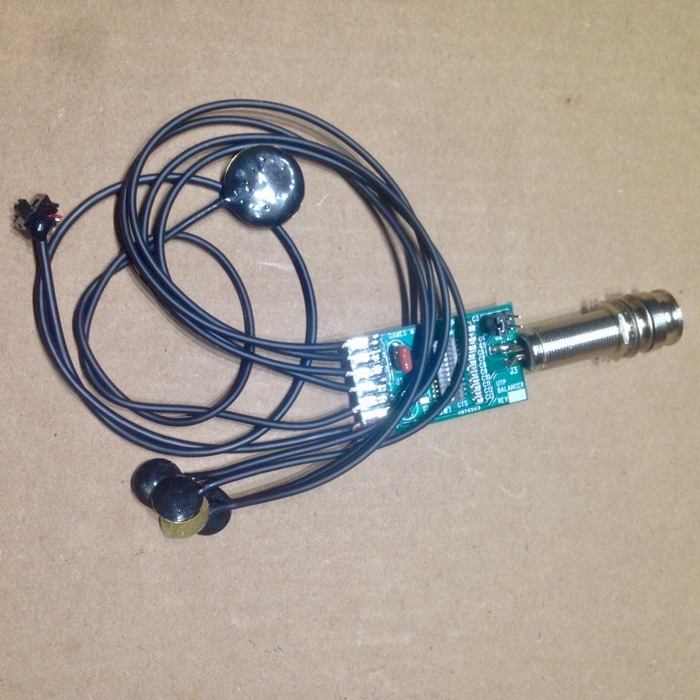 As with the method above, using testing equipment, it is necessary to walk through each DIP switch setting to locate the ideal switch to leave in the ON position. The shorting jumper needs to be installed in position 2 (the middle position). With all switches set to OFF, starting with switch 12 I flip the switch ON, strum across the strings, make a mental note of what I hear, flip the switch OFF, proceed to the next lower numbered switch, repeat the process, comparing the sounds of each setting. For optimal feedback suppression, I am looking for the setting where the bass response has been reduced the most. For the best overall sound, however, I may prefer to set the next adjacent switch to ON, setting my “optimal position” switch to OFF, instead. Through this brief trial and error process, setting one switch ON with all others set to OFF, and listening to the output I can quickly set up my Ultra Tonic pickup. NOTE: If you carry a couple of extra tools with you to a performance (for endpin jack removal and for accessing the tiny DIP switches), you can readily make an adjustment to the switch settings, if it is ever needed. This pickup changes things. I am impressed with the ingenuity behind it’s simple design. Paired with the ToneDexter, I believe I possess the closest representation to a mic’d guitar I have yet encountered, and without the feedback!